Jim Hawes sent me a collection of slides shot in 1968 by Jim Serniuk. 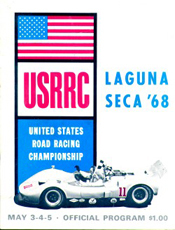 The events covered in the Serniuk Collection are the Can- Am event held at Laguna Seca on Oct. 13, 1968; the Laguna USRRC event held on May 5, 1968, and support races from those two weekends' competition. Support Races: Sports Cars -- May 4-5, 1968 Pit Shots Formula 5000 Cars (Not Available yet.) Earlier Jim Serniuk Photo Contributions!